• Most people who do it aren't alcoholics. • About 90 percent of the alcohol consumed by those under 21 is in the form of binge drinking. • It's more common among those ages 18–34, but those 65 years and older report binge drinking more often. • It's twice as common among men. • Those with household incomes of $75,000 or more are more likely to binge drink than those with lower incomes. • About 70 percent of binge drinking involves adults age 26 older. 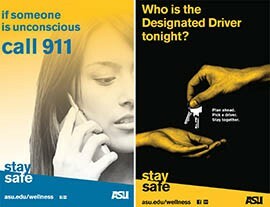 It’s just one way ASU is promoting safety when it comes to alcohol use as well as discouraging binge drinking. “We wanted to help the students be fully responsible for themselves and their community,” ASU Wellness Director Karen Moses said. According to the Centers for Disease Control and Prevention, 90 percent of alcohol consumed by those under age 21 is in the form of binge drinking, which is typically considered consuming five or more drinks in about two hours for men and four or more drinks in about two hours for women. The dangers to binge drinkers, including alcohol poisoning, intentional and unintentional injury, driving while intoxicated, sexual assault and more, have ASU and other state universities getting the message out as the school year begins. 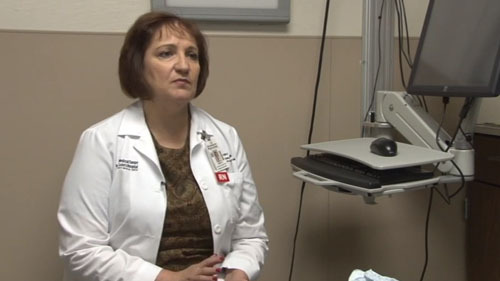 That’s welcome news just down the road from ASU at Tempe St. Luke’s Hospital, where Director of Emergency Services Janet Backers said about a quarter of those admitted are suffering from the effects of an alcohol-related illness. Half of those are students, most of them with acute alcohol poisoning, Backers said, something that’s readily apparent when they are blue from breathing problems caused by excessive drinking. The health problems, which can be life-threatening, also include irregular heartbeat, stroke risk and neurological damage. At the University of Arizona, a health educator from Campus Health and Wellness visits residence halls, Greek houses and elsewhere to offer The Buzz, a program weaving lessons about drinking around games and quizzes. One activity has participants tossing a ball to each other as they propose ways to moderate their drinking. “Alcohol abuse is one of the top two issues university students face that impacts their academic performance and career choices,” said David Salafasky, UA’s director of Health Promotion and Preventative Services, which oversees the program. Northern Arizona University offers those in residence halls a Red Cup Checkup, which includes each student pouring water that equals the amount of alcohol in a standard drink to see how much they would be consuming. On top of alcohol-education events throughout the school year, NAU holds Flannels and Flapjacks, a free pancake breakfast and celebration on the morning of homecoming. That counters a tradition known as Tequila Sunrise, in which some students mark homecoming by drinking throughout the day. More than 800 students opted for pancakes last year, said Kasondra McCracken, an NAU health educator. “The event is a fun and funny way to keep students from spending a whole day of drinking,” she said. In addition to its posters, ASU recommends to all new students an online module called Alcohol-Wise, which includes a survey about drinking habits, feedback specific to those habits and lessons on preventing sexual violence. It includes a second part that’s completed 30 days later. ASU requires Alcohol-Wise for students who get in trouble for drinking, especially underage drinking. UA requires all new students to complete eCHECKUP TO GO, an interactive Web survey about a person’s drinking habits that’s part of ASU’s Alcohol-Wise program. At Tempe St. Luke’s Hospital, Backers said ASU’s message to call 911 when someone has passed out is vital because that’s a sign of alcohol poisoning or other health problems requiring emergency care. “Don’t pass it, because it could help save someone’s life,” she said. Cronkite News reporter Mackenzie Scott tells us how common binge drinking actually is among students. Posters in residence halls alert Arizona State University students to the dangers of excessive drinking.